Authentic recipes for licitar are closely-guarded secrets handed down from generation-to-generation. Some will argue that they differ from gingerbread in that honey, not molasses, is used, nor are there any of the spices associated with gingerbread. But some recipes, like this authentic one from Zagreb, don't even use honey. Honeybread or gingerbread can be found throughout Europe. In Austria and Germany, they are known as lebkuchen or lebzelter from which came the Croatian name licitar. They're known as pernik in the Czech and Slovak republics, pierniczki in Poland, medenki in Bulgaria, medenjaki in Slovenia, and pryaniki in Russia. 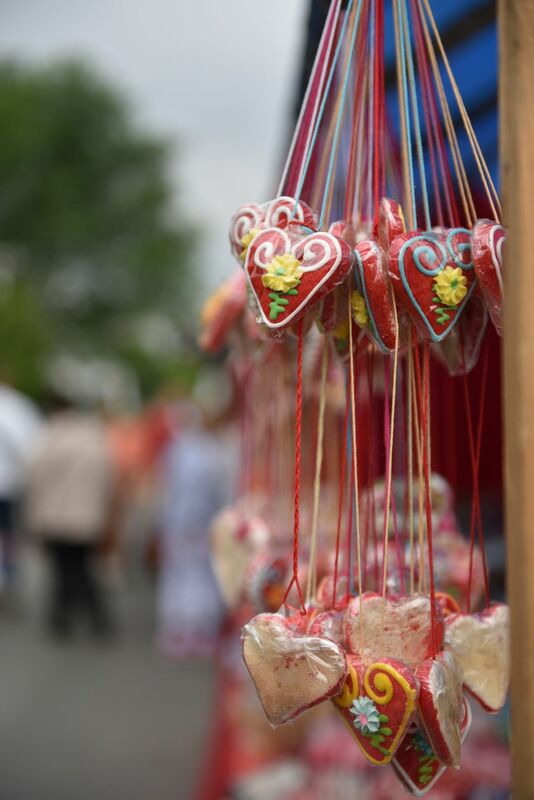 Croatian licitars originated in Northwest Croatia but have become a national symbol of the country and are highly sought souvenirs. Licitars can be made into doll, bird, mushroom, horseshoe, wreath and horse shapes, among others. What sets them apart from other honeybreads or gingerbreads is their red, shiny glaze and highly-piped royal icing decorations. Some have embedded pieces of shiny metal that look like a mirror. Licitars adorn Croatian Christmas trees and are given away as a token of love to family members and lovers, who keep them forever and display them in their homes. Don't be put off by the call for licitar yeast in this recipe. It's just another name for hartshorn or powdered baker's ammonia (ammonium bicarbonate). If this isn't readily available to you, substitute an equal amount of baking powder. In a medium saucepan, dissolve the sugar in water over low heat. Let cool to room temperature and preheat the oven to 350 F.
In a large bowl, whisk together the licitar yeast and flour. Add the cooled sugar water and knead until smooth. Roll dough out on a lightly-floured surface or directly onto parchment-lined baking sheets and cut with copper ​licitar molds known as šteheri or regular cookie cutters into a heart and other traditional shapes. Make a hole in the top of each shape for hanging ribbon. Remove scraps and bake 8 minutes or longer or until golden in color. Repeat with remaining dough. Place a string through the hole and dip each cookie into the red glaze and hang to dry completely. Prepare the royal icing. Leave white or add food coloring of choice. Pipe curlicues and other designs on the red-glazed licitars. Let harden completely and tun a thin length of red ribbon through the hole, if hanging up.